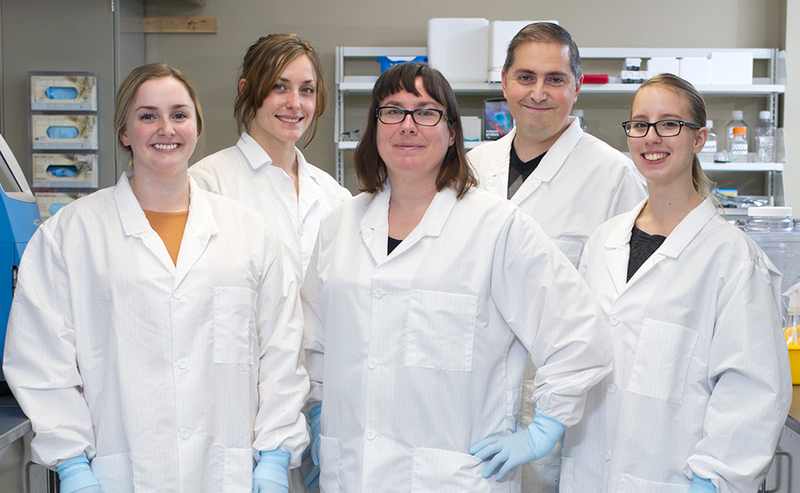 The endogenous retrovirus research team, from left: Meagan Allardice, Marie-Josée Nadeau, Renée Douville, Domenico Di Curzio and Breanna Meek. Science is all about facts. So it may come as a surprise to some that University of Winnipeg scientist Renée Douville's interest in the exotic field of endogenous retroviruses was first inspired by a work of fiction. In 2005, Douville was working on her PhD in immunology when a colleague passed her a copy of a science fiction thriller called Darwin's Radio. Written by Greg Bear, the novel tells the tale of two scientists who try to contain the spread of an endogenous retrovirus that threatens to destroy humankind as we know it. "It's a work of fiction, but it's about endogenous retroviruses and it made me more curious about them," says Douville. Endogenous retroviruses are ancient bits of genetic coding buried in everyone's DNA, the double-helix molecule that contains the genetic code for all life. This makes them different from typical retroviruses which spread between people, such as HIV. Domenico Di Curzio uses a confocal microscope (right) to view sections of brain and spinal cord tissue. While endogenous retroviruses are not capable of the kind of biological mayhem outlined in Bear's fictional book, they have been linked to a number of neurodegenerative disorders and cancer. 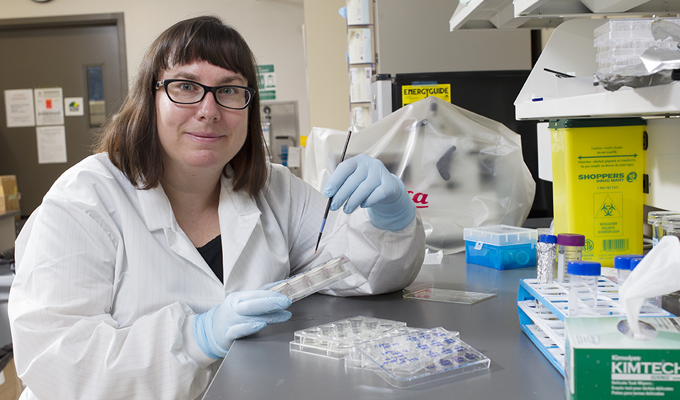 Specifically, Douville and her team at UWinnipeg are focused on an endogenous retrovirus known as ERVK, which is associated with a large number of diseases, including breast and prostate cancer, melanoma, rheumatoid arthritis and lupus. Scientists studying human tissue also see ERVK in cancer cells, in the knee joints of people with rheumatoid arthritis and in spinal cord and motor cortex tissue of people with ALS. Now, Douville is about to publish two papers. One shows how ERVK is capable of producing a toxic protein that damages brain cells linked to amyotrophic lateral sclerosis (ALS), schizophrenia and multiple sclerosis. The other, shows how the ERVK protein - known as "integrase" - can be prevented from damaging DNA. Douville has also applied for a patent on the toxic protein, with the goal of licensing her findings to a pharmaceutical company that would collaborate to do further research. The research that led to the recent patent application took seven years. However, the development of any potential drug treatment flowing from the research is still a long way off, says Douville. "It's a long process, and much more research is needed," she says. Douville first started researching ERVK and its connections to neurodegenerative disorders soon after beginning a post-doctoral fellowship in 2008 with Dr. Avindra Nath at Johns Hopkins University in Baltimore. Nath, a leading expert on the neurological effects of AIDS, caused by the retrovirus HIV, had a new line of research in his lab in the area of endogenous retroviruses. Douville was able to sink her teeth into the work. Eventually, she took a second post-doctoral fellowship at McGill University in Montreal in 2010. At McGill, she says she became more involved in managing a lab and began to think that she would like to take on that role herself as a professor. So when a position was offered at the University of Winnipeg, she was able to return home and launch the RetroFIND (Retroviruses Found In Neurological Disease) team. A magnified image of pyramidal neurons in the motor cortex of a patient with ALS. The green colour highlights endogenous retrovirus protein. The red-orange color indicates the presence of DNA damage. A slide with two spinal cord sections: one cervical spinal cord and the other lumbar spinal cord. This slide will be viewed using the confocal microscope. Today, working in her bustling lab at the UWinnipeg's Richardson College for the Environment and Sciences on Portage Avenue, she plays a number of roles simultaneously: research scientist, teacher and manager of multiple projects with hundreds of thousands of dollars of funding. Two grants from Research Manitoba (establishment and operating), as well as a grant from the Canada Foundation for Innovation, allowed her to equip the lab with technology that lets her to peer into human cells. She has a confocal microscope that allows her to take 3-D images of cells, as well as a device for analyzing proteins, called a Western Blot imager. The Western Blot allows researchers to see what proteins are present in a sample and how intact they are. She also recently received a three-year US $300,000 grant from the American ALS Association to continue her work on ERVK. Douville says research into endogenous retroviruses has come a long way over the years. As she explains, there are many types of endogenous retroviruses in the human genome. In fact, Douville says that more than eight per cent of our DNA is of retroviral origin. That is, at various points in our evolutionary history, millions of years ago, human egg and sperm cells were infected with viruses that were able to insert themselves into the DNA of their hosts (our ancient ancestors). Over time, these viruses have made their way into every human alive today. "A lot of the viral components of our genome are very ancient," Douville says. For the longest time, this retroviral coding was thought to be part of the 40 per cent of genetic information that scientists thought of as "junk DNA." This genetic information, it was thought, was some kind of obsolete genetic cargo that no longer did anything. But more recently, scientists have shown that retroviral elements can have both positive and negative effects. For example, some endogenous retrovirus proteins, called envelope proteins (which are used to attach a virus to the cell it infects), help humans to stick the placenta to the mother's womb. Another part of retroviral DNA, known as a viral promoter, turns up the amount of a key enzyme in saliva (and salivation is essential to our ability to digest food). 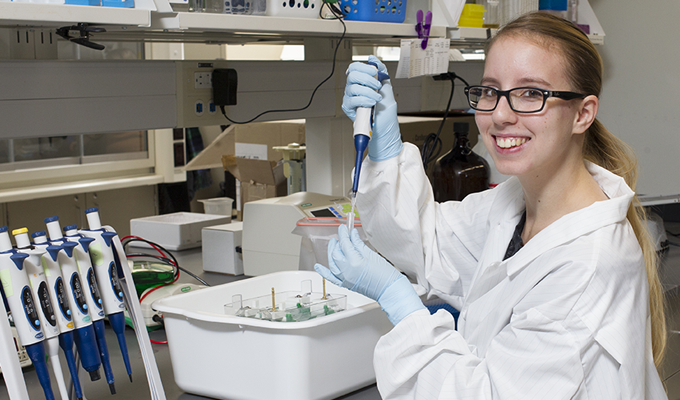 Breanna Meek loads protein samples into a western blot gel for analysis. ERVK is a more recent hitchhiker in our DNA, likely becoming incorporated into the ancestral human genetic code about 200,000 - 25 million years ago. "For a long time, people said ERVK was a simple retrovirus, but I think it's more complex than that," says Douville. On a daily basis, the lab work involves looking at extremely detailed 3-D images of brain tissue from people who had ALS, schizophrenia or other conditions to identify specific type of cells that have been damaged. The confocal microscope images provide a glimpse into the brain at the level of neurons. In one impressive set of images, a group of motor neurons are positive for ERVK in a patient with ALS. The image shows the damaged areas in red, while the areas with the viral protein turn green. The colours line up, illustrating the connection between the retroviral protein and damage to the cell. An adjoining room attached to the main lab is a high-biosafety lab, set up with negative air pressure and biosafety cabinets. Here, Douville, her students and colleagues work with cultured cells, including ERVK-producing cancer cells. For this part of the research, Douville and others on the team are fully protected with double layers. Typically, they work in teams, so that one person will be in the secure area fully geared up, while another one is outside and able to help if needed. The work itself may involve "feeding" cultured cells by providing them with fresh media (essentially sugar water) or cleaning out wastes from the cultured cells by replacing the old solution. It's something that has to be done all the time, whether it's a weekend or the Christmas break. As Douville notes, "cells are like babies. You have to feed them regularly on their schedule, not yours." Renée Douville uses a paintbrush to strain brain tissue sections to prevent damaging the samples. As with any scientific research, the work involves a great deal of repetition. Culture the cells again and again, and look at them. Repeat the process, with slight variations, again and again. Another part of the research involves computational data crunching - known as "bio-informatics." Research associate Matthew Turnbull, a former master's student of Douville's, works with her on this aspect of the research, thanks to funding from the Natural Sciences and Engineering Research Council (NSERC). Bio-informatics involves searching vast databases available at institutions like the U.S. National Institutes of Health. In this work, researchers use the computer to model possible protein interactions with ERVK and determine ways to detect these proteins and where they may be found. That way, when they start experiments at the bench, they already have a good sense of where to look and what to look for. "It saves time and money, by having insight that allows us to make a better first guess," Douville says. It's a process that scientists refer to as "in-silico" research. Where "in-vitro" research involves test tubes and cell culture plates (vitro comes from the Latin word for glass), "in-silico" research takes place within the processor of a computer. Of course, "in-silico" research needs to be followed by additional work at the research bench. In fact, it was this bio-informatics work that led the team to characterize the toxic ERVK proteins linked to ALS and schizophrenia. 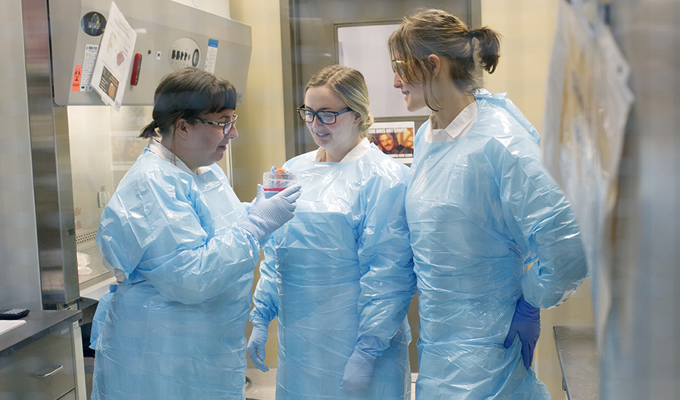 Renée Douville, Meagan Allardice and Marie-Josée Nadeau dressed in personal protective gear inside the tissue culture room adjacent to the main lab. By analyzing human genome data, they were able to consider all the different ways that ERVK could make a protein. Then they developed an antibody that could be used to detect the presence of the protein they were looking for. Using confocal microscopy, they found it in tissue of people who had those two conditions. (One of the diagnostic marks of schizophrenia is the way patients' motor abilities may be affected. Douville's research showed damage to motor neurons in tissue from people who had schizophrenia.) The bio-informatics research also indicated that the protein should be present in brains of people with MS, but the lab has not yet begun the bench science to follow that up. As Douville acknowledges, this is a long road. It could take decades to go from a basic science discovery to a drug that has been fully tested and developed so that it's accessible and affordable. Because there's so much more to learn, an important part of her work is training more scientists to explore the connections between endogenous retroviruses and disease. That's why she has undergraduate students working on their honours theses in her lab - along with PhD and Master's students, and postdoctoral fellow Domenico Di Curzio. It's not every day you see undergraduate students working in a lab doing such cutting-edge research. Her honours students know they're getting a lot of experience in her lab. "I am very proud to say I am a part of this lab." says Meagan Allardice. "To have the opportunity to see the work that Renée does firsthand is pretty amazing. Even though I am an undergrad, I am a part of the team. I get to see and be a part of almost everything we do." Lab mate and fellow honours student Breanna Meek agrees: "Reneé gives us opportunities that allows us to gain important skills that will make us better researchers moving forward." Both students are planning to continue with their science studies at the graduate level. For her part, Douville recognizes the mutual benefits of working with budding scientists. Not only do the students get experience, they also bring a new perspective to the questions they ask. "It's a benefit to put new eyes on a problem." 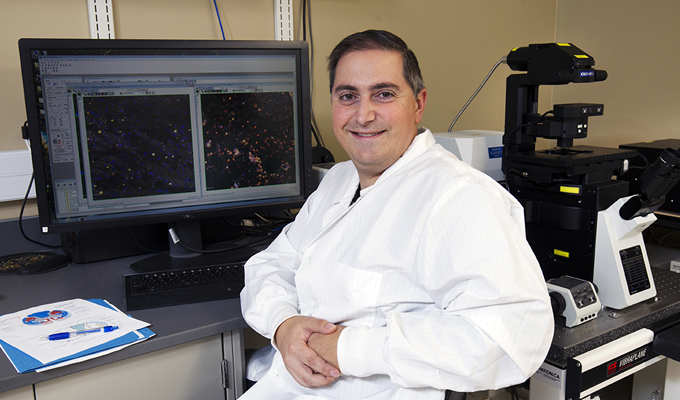 Research Manitoba provides financial support for scientific research in the province. budget of $12 million and supports researchers working in the fields of health, natural sciences, social sciences, engineering and the humanities. It does this through a variety of grants and programs that focus on the supporting new and mid-career investigators. In addition, Research Manitoba helps provide salary support for trainees through various partnerships and fellowships. To learn more about Research Manitoba, and how it is supporting Manitoba's research community, visit www.researchmanitoba.ca. RNA - a long, single-helix molecule that, among other things, acts as a messenger to pass the genetic information from DNA to the proteins that cause cells to act. Protein - large, complex molecules that come in many types and are required for the structure, function and regulation of the body's organs and function. Enzyme - a type of protein that reads the genetic information contained in DNA and acts as a signal or switch to turn on or off various functions in the body. Retrovirus - a kind of virus that consists of RNA. Retroviruses are able to use an enzyme called integrase to insert a copy of themselves into the DNA of their hosts. Endogenous Retrovirus - the term "endogenous" means "having an origin within." That is, instead of being something a person is infected with from outside, these are retroviruses that are already within all of us.